Students participate in a team-building exercise. 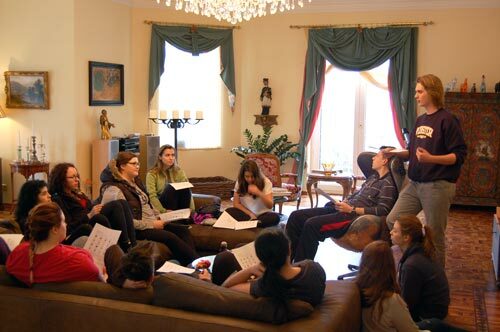 Earlier this month students in the Webster LEADS leadership program from the Vienna campus gathered in Hainburg for Webster Vienna's first-ever 24-hour mini-leadership retreat. Ten freshmen and four upperclassmen senior student leaders attended. Led by the program's senior leaders and Student Affairs staff, the group worked on team-building, goal-setting, reflection, team-work, and group communication. Activities included mapping their leadership journeys, cooking, and discussing different leadership personalities. "We hope the freshmen students will now be better prepared to adopt leadership roles on campus, whether in student government, as New Student Orientation Leaders or in other capacities," said Jesse Alexander, Student Community coordinator. "But more importantly, they've learned something about themselves that will help them be better leaders in their own lives and communities." "The LEADS retreat was a great opportunity to come together and work with like-minded peers who are driven and diverse," said senior leader Alexander Brosseau. "It made me recognize what my strengths as a leader are, and how to help others do the same." The WebsterLEADS mini-retreat in Vienna was designed to connect students and help freshmen better prepare to adopt leadership roles on campus. Freshman Stephanie Bürger was likewise enthusiastic: "The retreat was awesome because you learn leadership skills in a relaxed environment!" The family of bachelor student Matthias Smolej offered their beautiful home overlooking the Danube River as a perfect venue for the event. For more scenes from the retreat, check out the photos in this Facebook album.